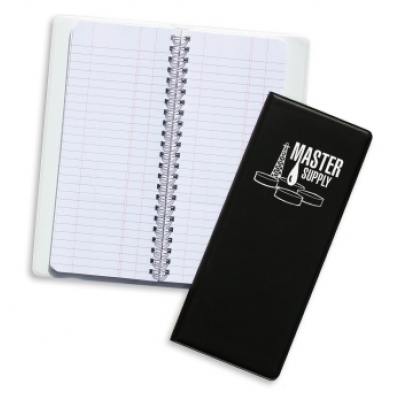 Wire bound tally book that lays flat for ease of use. A popular wire-bound tally book with a firm cover, for your convenience. It lays flat when open. Great for gas and oil rigs, and water line people. Price includes one color hot stamp imprint on the front. Imprint size for hot stamp imprint: Up to 10 square inches on the front. Imprint size for Full-Color imprint: Full front and back. Option: Full color imprint at extra charge shown in drop down menu above. Option: Clear Pen loop sealed into tally book for convenient insertion of pen. Located part way down, inside front cover, or other locations per your request. Other Options: An economical 2-color or 3-color imprint is available. Send us your logo for a quote. Our art department can pick the best imprint method for your art. Whether hot stamp, screen printing, or full-color imprinting. We have kept this page simple, for clarity. But, our printing processes are very versatile. Option: Screen printing your imprint. $0.39 per imprint color, plus setup charges. Option: Pantone color matching of imprint colors for screen printing your imprint: $30 per imprint color. #113 Blaze Orange is a translucent material.